How many bands get an hour to play, let alone an hour to warm up?!? That's the thought I left GM Place with after the three-hour journey known as 'An Evening with Rush.' As with most journeys, this one had its downs and its ups. Unfortunately, it seemed to have a lot more downs than you might expect. The start of the show saw me at the foot of the stage, photopass stuck to my shirt, photographing the band's first four songs. 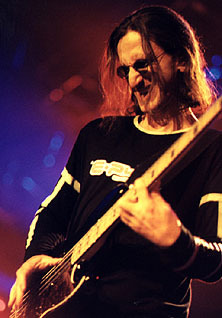 A few things immediately stuck out: (1) like a lot of middle-aged guys, guitarist Alex Lifeson is puttin' on the pudge; (2) drummer Neil Peart did not look happy, and did not look like he wanted to be there at all; and (3) bassist Geddy Lee, with his little specs, elfish grin and hair straggling around his beaky face, was having a ball, bounding around like a little kid. Oh, and (4) the first few songs were coming out kind of, well, boring. That didn't really change as another photographer and I made our way to our seats. For nearly the next hour we watched and periodically looked at each other in disbelief: "This is really bad." A couple songs came out OK, like "Red Barchetta," but others, like Counterparts' "Animate," positively stunk, coming out lifeless and uninspired. I really started wondering how the trio has come to delude themselves into thinking that some of the material from the last few years is any good; true, some of it is good, but some of it should not be seeing the light of stage, tonight. Disheartening, indeed. Everyone cheered for the sake of it, but how long would that last? The stage show was really strange, too. The Jumbotron screen was certainly at its best when used with the dozen or so cameras scattered about the stage (and even inside Peart's kit) to show the band writ big. But it was only used that way for a few songs. Then some lame footage would be thrown up behind the band, then no footage, then some live footage, then lame footage... arg! 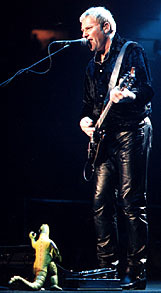 Meanwhile, whoever was running the light board must have been listening to his Walkman, as the lights certainly had nothing to do with what Rush was doing. Then they played "Closer to the Heart." They finished the 2112 suite and abruptly intermissed for (exactly) twenty minutes. Uh oh -- isn't this going to kill the momentum? Evidently not. They trooped back out on stage, continued to mix old and new tunes and managed to keep the spark alive to varying degrees. Evidently, too, they fired their lighting guy during the intermission, as finally there was some sense of purpose to the visual show -- and finally they brought out the lasers!! What's a Rush show without lasers?!? And what's a Rush show without a drum solo? 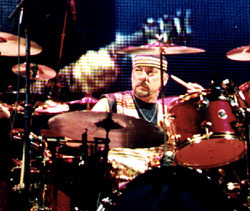 Peart's solo was cool, though mostly because the Jumbotron put you inside the kit with Peart, and the frantic editing kept you riveted; when they went to canned video footage for the middle section, you couldn't see him anymore -- it was all sound with no fury. He did some good work with a MIDI'd xylophone type thing, and, though he was still grumpy, he deserved the standing ovation when he finished. The absolute highlight of this journey, in the end, had to be "Spirit of Radio." It completely SMOKED. 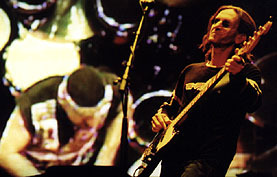 It was an as invigorating and exciting performance as I've seen from any band, period. And I don't know what Lifeson said to Peart during the song, but a big grin split the sullen drummer's face wide open on the Jumbotron, and he laughed, and finally seemed to really be enjoying himself. Woohoo! 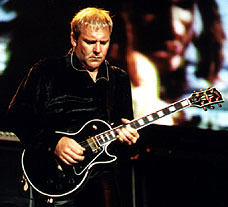 Lifeson and Lee were meanwhile tearing up the stage and their fretboards, while the crowd, understandably, went insane. For another review of the same show, click here.